Welcome to February’s Blurt It Out Foundation Buddy Box. 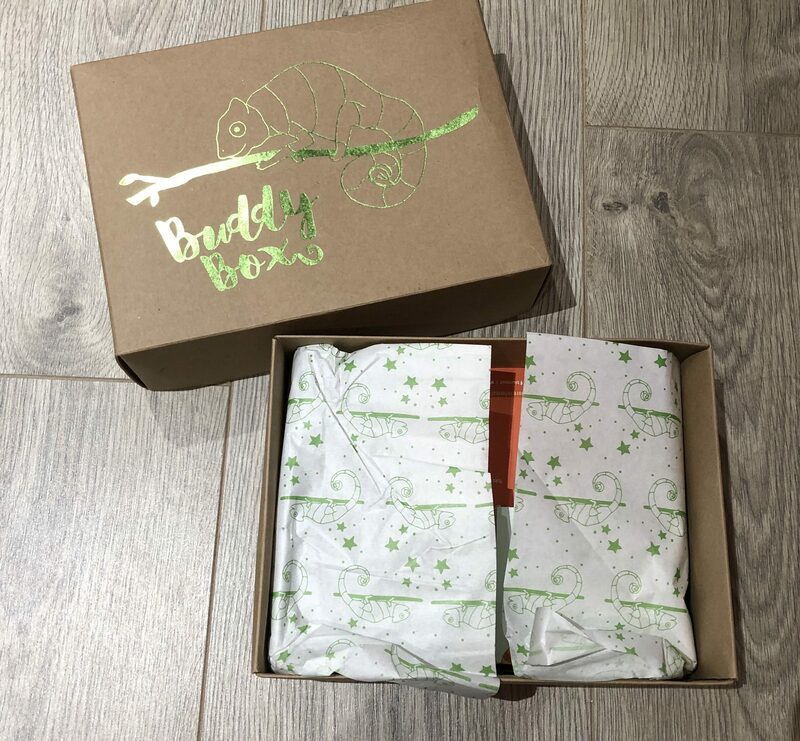 If you are new I would firstly like to explain a little more what a buddy box is and how to describe it to someone. A buddy box is to be described as a hug in a box. 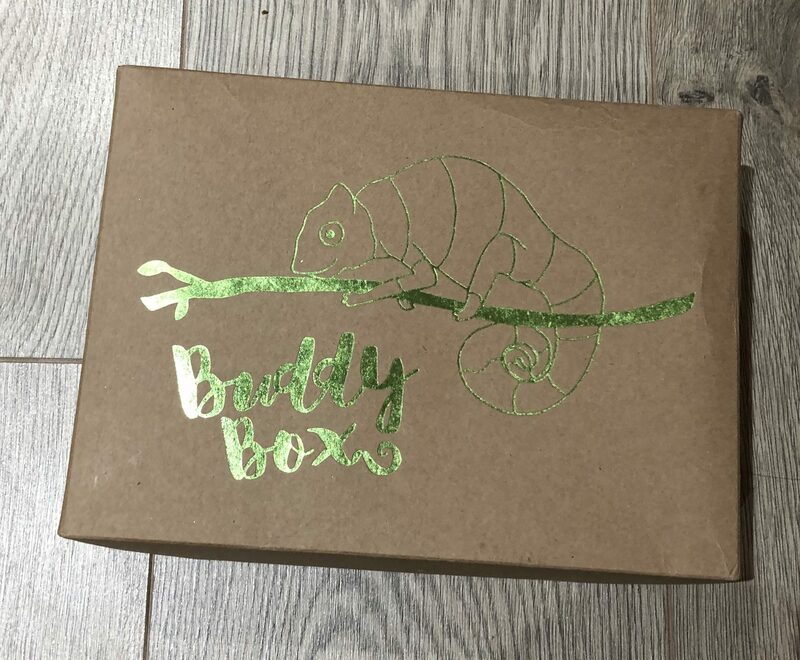 A buddy box is designed for anyone but is aimed at those with mental health problems or a box for self care. As many of you maybe aware I am a huge fan of self care and that is why I get this subscription box each month. The box costs me £21.50 per month and I am on a rolling subscription, meaning I can cancel whenever I want. The good thing about this box is that it comes with 5 full size products. 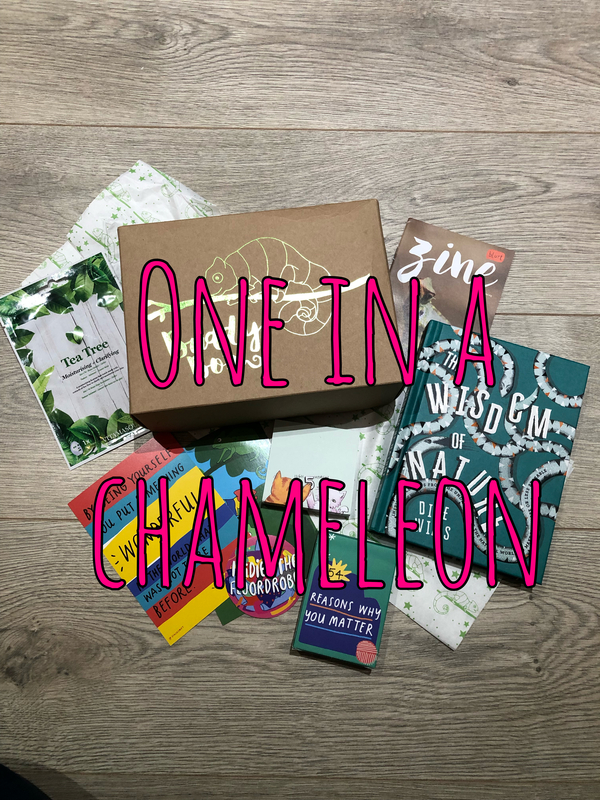 Each month it has a theme and this month’s is ‘One in a Chameleon”. Buddy boxes are also super good presents. Imagine a friend buying you one as a surprise when you are unwell or feeling a little run down. My buddy boxes always put a smile on my face and makes me excited to open and see what random goodies I have received. I find the packaging the cutest. Every box I have received so far has been a brown cardboard box with metallic writing and an image to match the theme also in metallic. 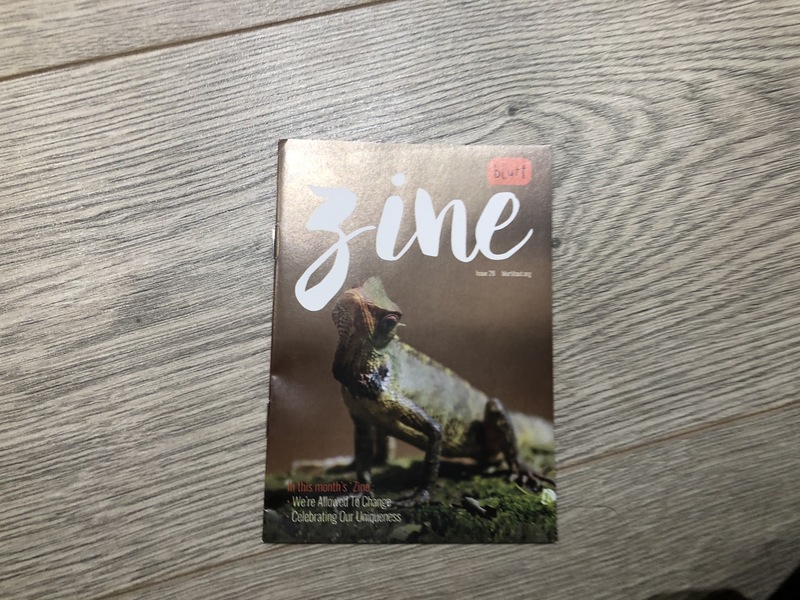 This month’s being a chameleon and green metallic writing. I think even though the packaging is simple and basic it actually still excites you to open the package. I also think the randomness of receiving one of these expectantly would really make you wonder what a buddy box is before opening it. Each box is lined with a layer of tissue paper and again this seems to always match the theme. You can’t fault The Blurt It Out Foundation for presentation. This tissue paper would look really good as wrapping for a little boys present. Especially if they are into lizards and creepy crawlies. The first thing I have pulled out of the box this month is these adorable cat post it notes. With the cats high fiving each others paws. Something as simple as a friend coming up to you, high five girl you have got this. 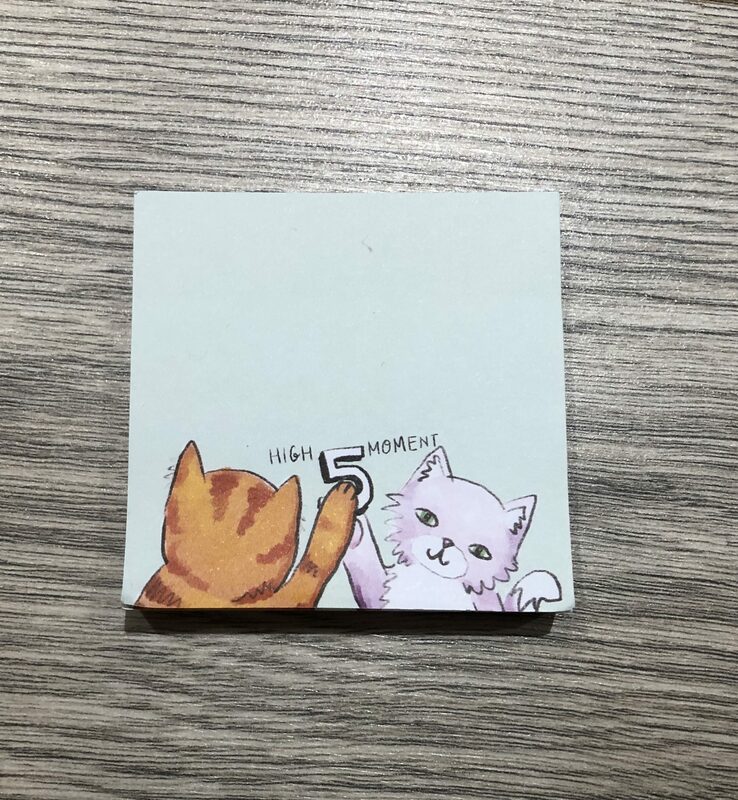 High five you are doing an amazing job. Imagine walking into work or school or even your boyfriend leaving you one of these post it notes in the morning with something kind and caring about you. Positive notes are always a good thing. Its also handy to have post it notes that can be stuck on work to remind you to do things or others to do them. We all have moments when we really feel bad about ourselves, think we are pointless and useless. Them days when people get to you and you feel useless. Well this is why you need these cards. They are amazing. 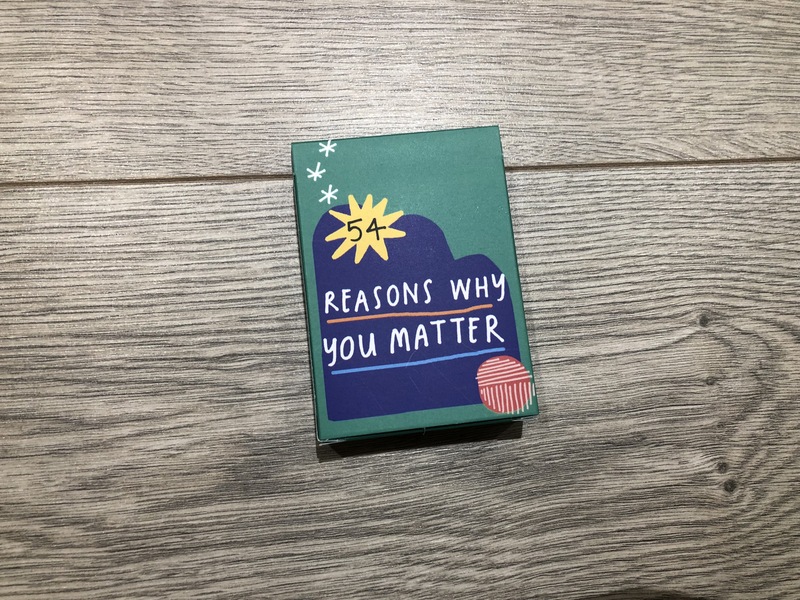 54 reasons why you matter. Well I have read about 4 of them and they each have reminded me of why I do matter. They each put a smile on my face and said ‘hey Mel you are amazing’. Its the note I definitely need when things are rough. Imagine hiding these around the house, then on the bad days as you get the pasta out the cupboard or put the washing away you find a card. Its the little things like this that make you stop and actually remind yourself of the goods things about you. Things like this sticker is what makes the box worth its money. Comment below who’s room actually stays clean and tidy. Who puts their clothes away 24/7? You can think ‘but Mel its a sticker how does this make the box worth it?’ Well the simple answer is that it made me laugh as soon as I picked it up. It reminds me of growing up and how my mum use to always tell my sister to clean her room up. 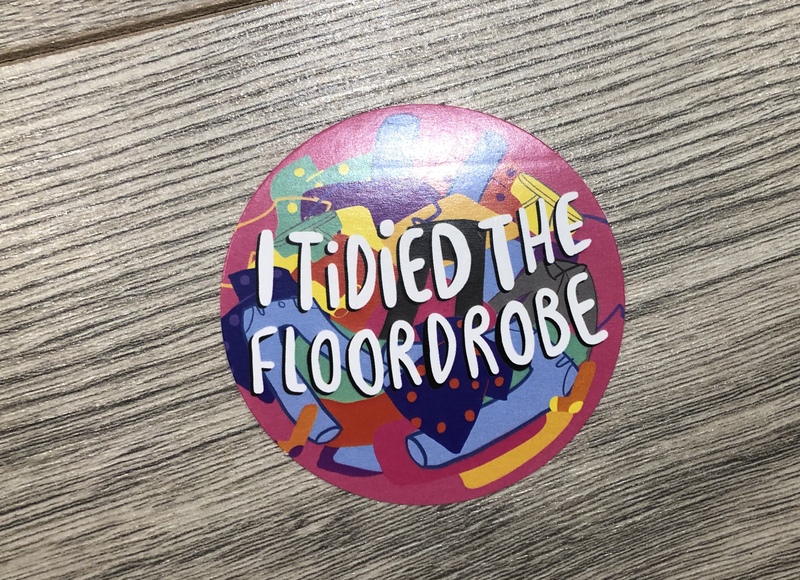 The wardrobe was the floordrobe. LOL As a teenager especially or even till I left the family home I didn’t really use the wardrobes for hanging clothes. Now I have my own place its different but even now I cannot be bothered to hang stuff up. I will only do it when I first get in otherwise I will wear it straight from the bag. With each box you get a little magazine just going through what the box means and how to be the champion. Even if the world tries crashing down on you and your feelings. Now self care is all about the face masks. This is one of my favourite things to do when I am feeling rubbish. A hot bubble bath followed by a little pamper. Face masks are so good too which helps. Tea Tree is really good for you and I have heard a lot about it for hair anyway. 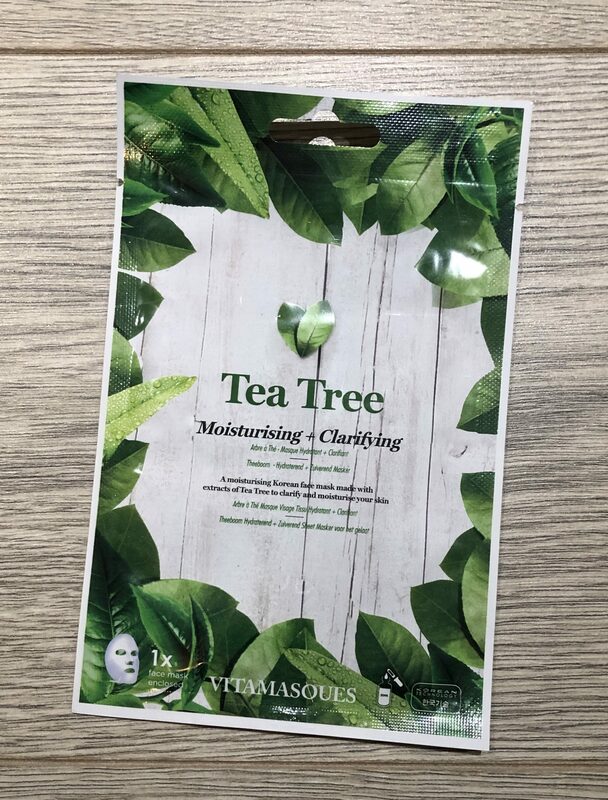 I cannot wait to try this face mask out. I love to read quotes, especially motivating ones. 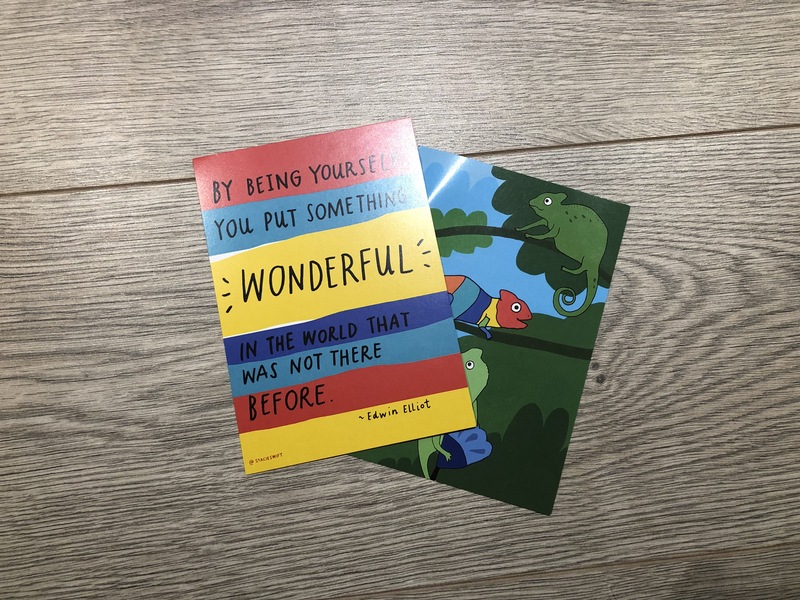 Each box comes with 2 postcards, one with a really good quote that inspires or motivates you. The other the image is what the box is about and the back has the price list on, as the majority of these are available outside of the box too. The last thing in this month is this book. I love reading of course and this book really looks interesting to read. 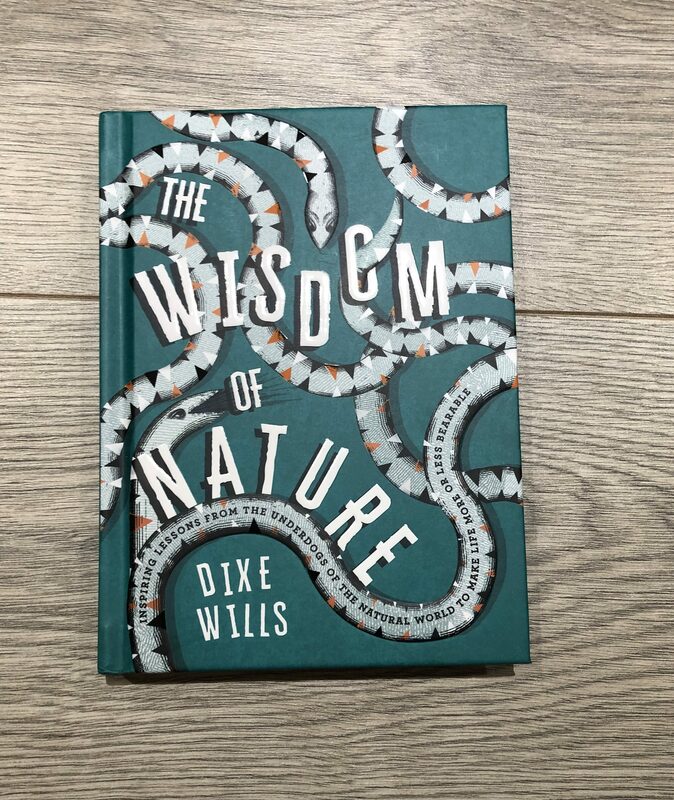 Its all about nature and how the creatures are and how they survive in nature. It looks to be an easy read too with a picture page then one with a short informative read. I can’t wait to read more of this book. One in a Chameleon is such a good book. Its something you can open and smile at. Remind yourself you are doing ok and check in with yourself to keep going. Not only that a friend or family member thats suffering, you can make their day but allowing them to receive this box. What is your favourite product from this box?